Take every single thing out of your cupboard. Sort them on your kitchen counter. Find everything that has a lid and put it on the container. Anything that does not have a matching lid, put in a pile. Look carefully for any item that may be overly stained, bent, cracked or chipped, put those in the same pile. Include all nonmatching lids. Take any container that was saved from ready-made food: cool whip, cottage cheese, yogurt, etc. put them in a pile. You are going to throw away, donate and/or recycle all nonmatching lids, broken, or pre-made food containers. Get them out of your house, now. You will promise to never, ever save a yogurt or cottage cheese container again. If you feel really bad about doing this then call in advance to a local preschool/daycare and ask them if they could use these containers for arts and craft. You will select a bag and put these containers in the bag after you used them, but they will never, ever go in your tupperware cupboard again. Also, evaluate any storage container that you have NOT used once in the past 12 months. Donate it. Get it out of your life now. When I first went through this process, there were several really quality Rubbermaid containers in my cupboard, however, I never used them. Like ever. #byebyeTake off the lids of all remaining containers and put them back in your cupboard, stacking them as much as possible to containers that are similar. Take a close look at what size containers you need to fit your lifestyle. Every house is different. We personally eat in about 98% of the time, so I know what size containers I need for leftovers. With two of us that work from home offices, we eat the heck out of leftovers for lunch. You are going to watch what you need for your own lifestyle, take notes on it. Not everyone needs a lot of huge squares 2-quart size containers. But some do. Whatever the case, jot it down on a stick-’em near the fridge. Choose a brand of storage containers that you want to purchase. I used to have so many different kinds of tupperware. Expensive ones to the throwaways made by Glad to knock-off brands. But then I find it confusing as they all don’t fit together to make it efficient for storing. That’s why people end up with cupboards that are overflowing and look like a war zone. Personally, I like the Glad disposable containers with red lids. I have chosen Glad – because they are a quality, affordable, clear and they don’t do major redesigns on their products. I don’t want to invest a lot of money on containers as I don’t want to freak out about them leaving the house and never returning. I don’t need that added stress in my life. (You know the person that is hounding you for their 25-year-old plastic container because they left it at your house. #notme) I will never buy a knock-off brand that will not fit with my others unless it’s an emergency and I’m making something that will leave my house forever. Please note: many people have opted to select glass storage containers. I applaud you, they ARE a healthier option. I’ve selected not to, but we never heat up our leftovers in the plastic containers, totally toxic to your food. Slowly weed out the old storage containers and buy the new ones. Hey, if you want to jump the gun and just get rid of every container (donate) and start over with new, then more power to you! But I caution you on this because you might be buying containers you really don’t need, but take up space. I did it slowly. Focusing on really using the containers that were technically “okay”, but didn’t match. Within a few months, I was able to move them out to the recycle graveyard. Plan on your stacking method. There are tons of online articles about smart ways to organize your tupperware cabinets. Most of them require you to install a new drawer or something else that is not feasible. So I just decided to keep it simple. 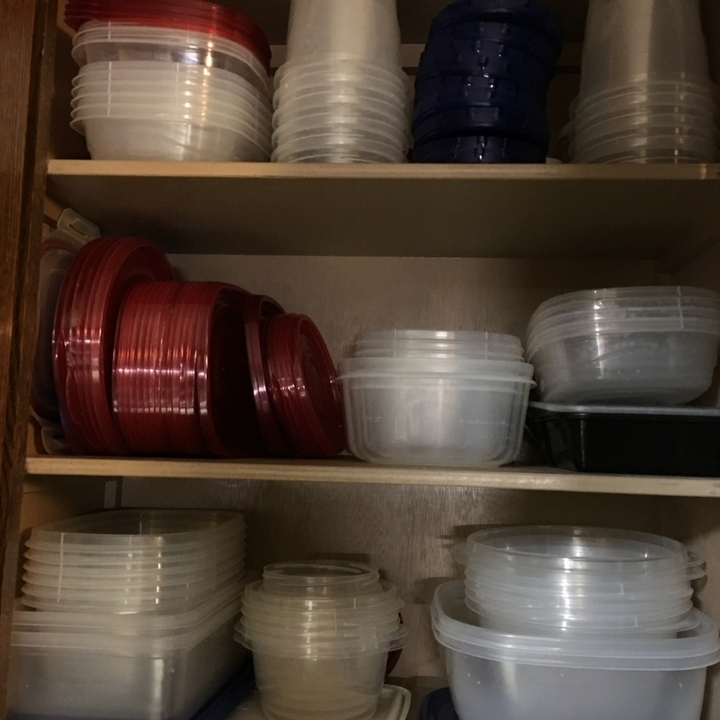 I like to put all the lids stacked vertically with other same size lids and keep the same size containers stacked within each other. You can clearly see what you are working with when you look for something. Benefits of doing this. Okay, so some of you are laughing at my OCD. Or, making an excuse, “I don’t have time for this” or “It’s not that important to me”. Fine. I get it. 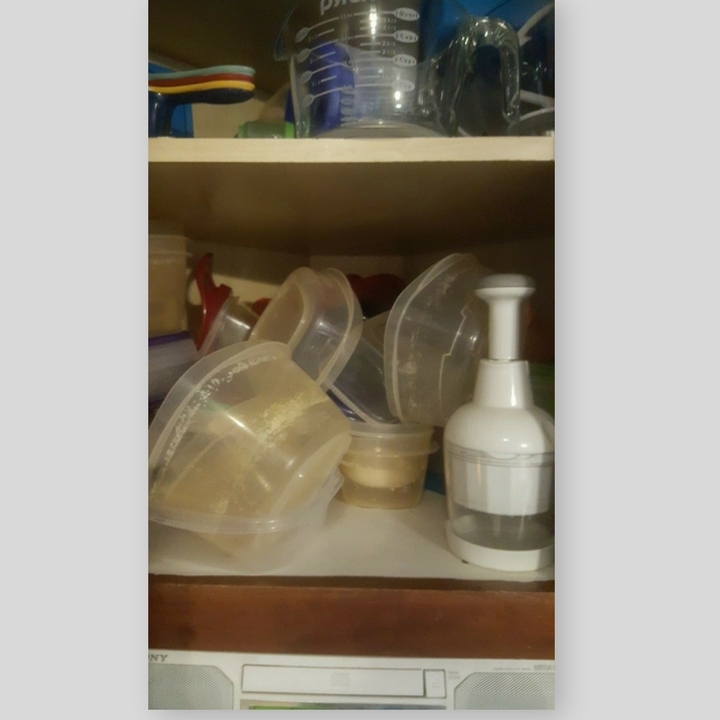 Trust me I don’t lose sleep if my cabinet cupboard is messed up. But once in a while, if I have five minutes …. like waiting for my dinner to finish, I will make sure the cabinet is neat. The benefits? Well, for one, the guys in my life don’t mind putting up the leftovers now that they can easily see the containers. Before doing this process, it was – 1. Put the leftover food in a container. 2. Spend the next three minutes trying to find a lid that matches, only to find out there isn’t one. 3. Move the food to another container and search for that lid. 4. Seven minutes have passed, more dirtied containers to wash. 5. Cursing ensues and husband and son never enter the kitchen again during after-dinner cleanup. Keep the extra LARGE containers somewhere else. I have some containers I need to use for big batches of cookies, etc. I need them, but only 2-3 times a year. Put these large types of containers in a different place. You want to keep this daily used cupboard clean and easy, or you’ll go back to be overwhelmed. You also don’t want to have to remove a large container and then fish around inside for smaller containers. Too much effort and it’s frustrating. You should see how I line up my glasses and coffee cups. Pretty much the same idea. Brothers and sisters together. Would love to hear your feedback, if anyone actually leaves comments anymore. What are areas of some of your struggles, I may be able to help?